PLEASE NOTE THAT THERE HAS BEEN A VENUE CHANGE. THE EVENT HAS BEEN RE-LOCATED TO EGG LONDON. ALL EVENTBRITE TICKETS ARE STILL VALID FOR USE AT EGG LONDON. EGG LONDON IS ALSO A 19+ CLUB. FOR ANYONE WHO HAS BOUGHT A TICKET AND IS UNDER THE AGE RESTRICTION CAN GET A FULL FACE VALUE REFUND. Following the success of Monstercat’s sold out showdown at London Fields’ Hangar, it was only natural that we’d call back one of the main artificers behind the colossal event. 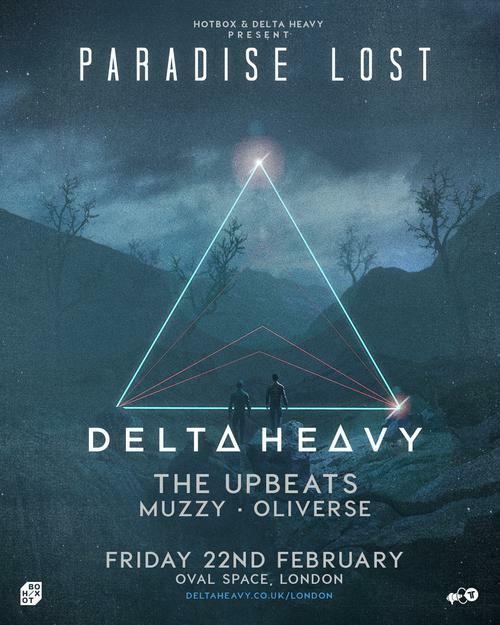 On the 22nd of February 2019 Ram Records’ and Monstercat’s Delta Heavy will be returning to London, hailing the underground hotbed that is Oval Space for a boisterous coming together that will surely go down in the annals of the drum n bass scene. Delta Heavy have been riding the wave of success for quite a while now and have somewhat become one of our own personal favourites. Millions of views and listens for their bawdy and eclectic belters, including doozy remixes of the likes of Dj Fresh, Nero, and Zed’s Dead, are proof that these guys know what they are doing and where to tread in music’s infinite ways. The show at Oval Space will represent a landmark moment for both them and us. Their biggest headlining show to date, this milestone moment will see outstanding levels of production along with Oval Space’s iconic terraces and view of East London’s sunrise as a back drop – we really don’t think it can get any better! We personally don’t want to miss this one and think you shouldn’t either. To not miss any announcements regarding the show in the future and for early access to tickets, sign up to delta heavy’s page!